Elchin Gasimov, deputy chairman of Muslim Union Movement, was subjected to brutal torture at the time of his arrest, Elchin Gasimov’s lawyer Elchin Gambarov said. “From Muslim Union Movement, Elchin Gasimov was first to be arrested. After his arrest, Nardaran incidents occurred and Muslim Union Movement’s chairman Taleh Bagirzade and others were arrested. During first days after his arrest, Elchin Gasimov was held in Sabunchu District Police Office, where he was subjected to ruthless torture. They tested different methods of torture on him. At the moment, Elchin Gasimov has a serious health problem. His internal organs have been damaged. They did not leave Elchin Gasimov alone in Kurdakhani detention center, either. They put him into the punishment cell. Elchin Gasimov was charged with organizing riots and illegal possession of firearms. He rejected all charges. But fearing for his father, he was forced to accept the charge of illegal firearm possession; after seizing a weapon from his house, the police threatened that unless he accepted the charge, they would arrest his father, too, and Elchin Gasimov accepted the charge,” the lawyer noted. 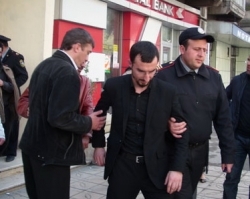 Background: Elchin Gasimov, deputy of Muslim Union Movement chairman Taleh Bagirzade, was arrested on November 5, 2015. He was initially sentenced to 30-day administrative arrest for insubordination to lawful requirements of a police officer, but afterwards he was charged with hooliganism and resistance to authority and was placed in pretrial detention. He was later charged with illegal possession of a weapon. Elchin Gasimov’s confinement in the custody of Sabunchu police office drew protests from believers.